The musician and 5 Spot impresario on the event paying tribute to the Band's legendary performance. 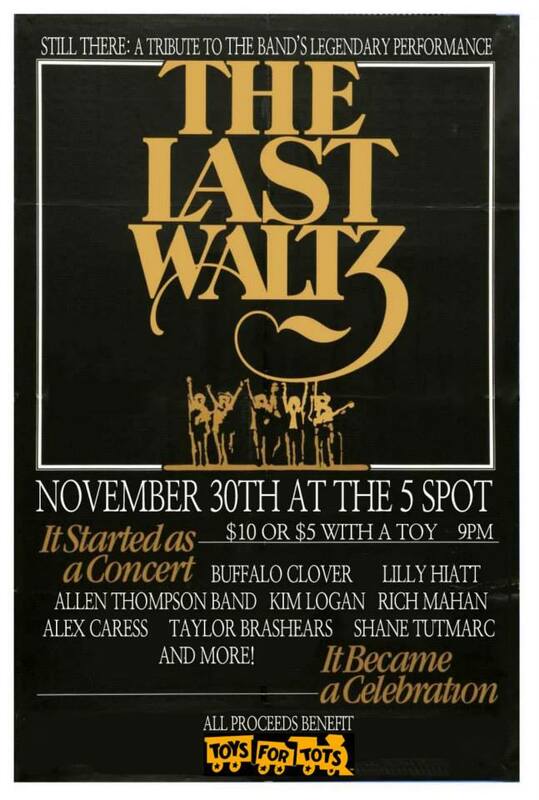 Tomorrow night, as we all recover from Thanksgiving-induced funks, family-shouting matches and spending too much on Black Friday LP’s, the only sane thing to do is to head to the 5 Spot, to see Buffalo Clover, Allen Thompson, Shane Tutmarc, Alex Caress (Little Bandit), Lilly Hiatt, Rich Mahan D. Patrick Rodgers of the Nashville Scene and Taylor Brashears pay tribute to the Band’s Last Waltz. Here, we had Allen and organizer and 5 Spot impresario Terry Rickards fill us in on what the event means to them. $10 or $5 with a toy. Proceeds go to Toys for Tots. P.S., speaking of the 5 Spot, come to this in December.